Not available for sale. 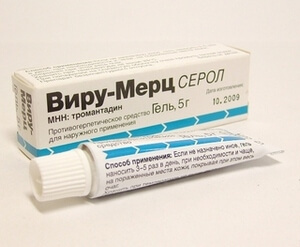 Last fixed price - 412 p.
Viru Merz is an antiherpetic antiviral agent for external use. The drug exhibits therapeutic activity against the virus Varcelle-zoster, as well as herpes virus infection types 1, 2 and 4. Simply put, against colds on the lips, genital herpes and shingles. Remarkable is the fact that viruses do not develop resistance to the drug components. The drug significantly slows down the process of penetration of viral agents into cellular structures. 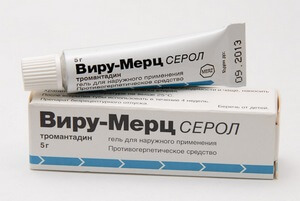 Already after the first external use of the Viru-Mertz gel, there is a noticeable decrease in the clinical symptoms characteristic of herpes virus infections: pain symptoms, burning, itching. Due to the highly effective drug recovery comes much sooner. And if the Viru-Mertz gel is applied at the very beginning of the pathological process (in the first 2-3 hours), then the subsequent spread of the infectious process can be avoided. The first clinical manifestations of the infection caused by the virus Varcelle-zoster - herpes zoster . In recent years, a lot of research has been done regarding the activity of Viru-Mertz in patients with molluscum contagiosum. As a result, experts have concluded that the tool has therapeutic efficacy against this virus, and after treatment there are no cases of relapse or drug resistance. The gel preparation is applied to the areas affected by the infection, about 3-5 times during the day, although more frequent use will have a positive effect on the rate at which the symptoms disappear. When applying the drug should be lightly rubbed into the lesion. 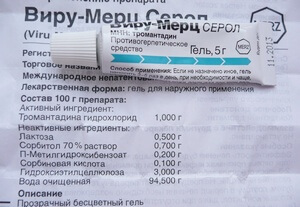 Duration of use is not more than 5 days. If, after two days of application, there is no improvement, then you should stop treatment and visit a doctor. Experts note that the effectiveness of therapy is repeatedly increased if treatment is started at the onset of the initial signs, when the disease is just beginning to manifest itself. It is worth noting that the use of the gel is not able to prevent infection with genital herpes, therefore during the treatment it is necessary to avoid sexual relations, even if clinical manifestations are completely absent. Strictly unacceptable application of the drug in the eye area. With intolerance to individual components of drugs such as thromantadine or paraben. 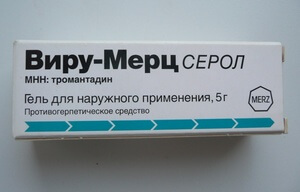 It is not recommended to use Viru-Mertz with a complicated form of running herpes virus infection. The effect on nursing and pregnant women has not been completely studied, so experts do not recommend the use of gel in the treatment of women during lactation and during pregnancy. In particularly exceptional cases, the drug is prescribed to pregnant patients, but only if the expected benefit to the mother is higher than the likely threat to the child. The manufacturer did not provide data on overdose. There is no information about the variants of drug interactions. Due to the use of Viru-Mertz gel, in rare cases an allergic reaction is possible, and even less often - contact dermatitis, accompanied by skin flushing, itchy sensations, burning sensation and noticeable soreness. The main active ingredient of the drug is thromantadine hydrochloride. Additionally, the composition contains adjuvants such as sorbitol, lactose monohydrate, gietelloza and sorbic acid, methyl parahydroxybenzoate and purified water. Externally, the drug looks like a transparent gel substance of a yellowish, brownish shade or colorless. As for the pharmacokinetic properties, the drug is absorbed immediately after application. After use in the blood and urine, the active substance is not detected. The drug is stored for a 3-year period after production. If the tube is opened, then it is necessary to use the gel in a 6-month period. Storage should be carried out in temperature conditions not higher than + 25 ° С, in places where children cannot reach. The drug is released without a prescription.